The National Career Readiness Certification (NCRC) helps to ensure a community workforce who is prepared for current and future jobs that sustain our economic base. The National Career Readiness Certification is a portable, recognizable skills credential that proves to employers that you possess the foundational skills relevant to specific jobs. The NCRC supports job placement, retention, and advancement. You can earn a Bronze, Silver, Gold, or Platinum NCRC depending on your scores. NCRC is based on a series of work-based assessments called WorkKeys®. WorkKeys® is a job skills assessment system measuring “real world” skills that employers deem critical to job success. These skills are valuable for any occupation and at any level of education. The test results provide valuable information for individuals, employers, schools, colleges, state and local governments, and training programs. Many employers in Wayne County and across the state use NCRC for selection, hiring, training and advancement. Nationally, the number of businesses engaged with WorkKeys® and NCRC is growing! To help you earn your NCRC or improve your scores, Wayne Community College offers training in an open lab-based environment. In this lab, you will have an opportunity to work with an instructor to assess your current skills, develop a personalized training plan, and hone your skills. In addition, you will be able to register for testing. A tuition fee waiver for this lab may be available for unemployed or underemployed individuals. Please come to an open lab session to get started on the process of earning or upgrading your NCRC. The lab meets regularly on the following schedule in the Walnut Building, Room 136. Mondays 9:00 a.m. – 12:00 p.m.
Tuesdays 1:00 p.m. – 4:00 p.m.
Thursdays 9:00 a.m. – 12:00 p.m.
NCRC Testing occurs weekly (days and times vary). Please see the monthly calendar for dates and times. Pre-registration is required at least one day prior to a scheduled test date. To pre-register, you may come to the lab, Walnut Building 136, or call 919-739-7004. SJAFB military personnel and their dependents must contact the Airman and Family Readiness Center at (919) 722-1123 to pre-register for a test date. Test Location: Wayne Community College, Walnut Building, Room 136. Plan to arrive at the testing center, Walnut Building 136, promptly at 8:30 a.m. or 12:30 p.m. depending on your scheduled test time. Once testing has begun, no one will be permitted to enter the testing center. Pay the testing fee via cash or debit card. The NCRC testing fee is $36.00. This fee covers the Applied Math, Graphic Literacy, and Workplace Documents WorkKeys assessments as well as access to print your Bronze, Silver, Gold or Platinum level certificate. 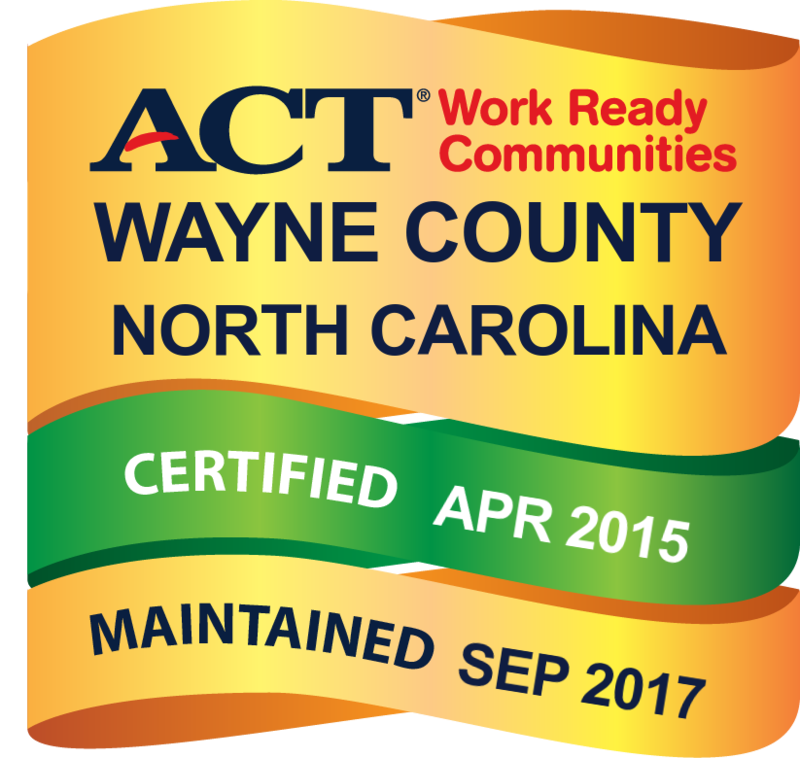 The retest fee is $12.00 to retake any NCRC WorkKeys assessment Please contact us at 919.739.7004 regarding retesting policies. Acceptable forms of payment: Cash, Debit Cards or Credit Cards (MasterCard or Visa). Third-Party Payment: A Third-Party Voucher Letter of Payment must be submitted to the test center, prior to the test date. Vouchers will not be accepted the day of testing. If you need your WorkKeys/NCRC Scores, there is great news! You have access to all of your WorkKeys scores at any time. Through myworkkeys.com you can publicize and print a copy of your scores whenever you need. For instructions on how to get a copy of your scores, go to myworkkeys.com. When you earn your NCRC, you may register your scores in several places. When you register for work with www.ncworks.gov, your scores are an important piece of information to include. You may share your scores in a national database by going to myworkkeys.com. Doing so allows you to share your WorkKeys® scores with employers nationwide. Set up an online account at myworkkeys.com so employers can verify your WorkKeys® scores quickly and conveniently. Add scores and information about your NCRC and your WorkKeys ® scores to your résumé and job applications. Take your WorkKeys ® score report or your NCRC to job interviews to show employers proof of your work-related skills. For more information about the Career Readiness Center Lab at Wayne Community College or earning your NCRC contact Mary Mills Borden, WORKS Lab Coordinator, at 919-739-7004 or mmborden@waynecc.edu. For more information about NCRC, WorkKeys®, and Certified Work Ready Community contact Nicole Brown, Director of Training & Development for Soft Skills, at 919-739-7011. If you have difficulties accessing a website with assistive technologies, contact our Web Content Specialist.